Ultra C By Beverly International, 100 Tablets at SameDaySupplements.com® for lowest price. Fruits and veggies are the best sources of vitamin C. Yet the average American doesn’t eat enough of either. This can weaken your resistance to colds, flu, and other common stresses. Ultra-C comes to the rescue by boosting your “C power” with 2000 mg of sustained-release vitamin C per tablet, double the strength of most Vitamin-C products. 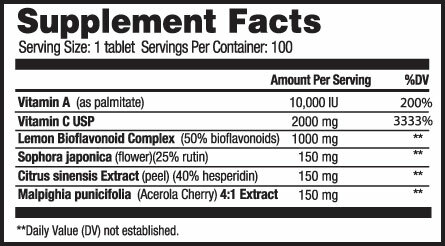 With 2000 mg of USP-verified vitamin C, equivalent to 16 cups of orange juice, one tablet is all you need. Acerola cherry extract, bioflavonoids from 100% whole lemon, and a tablet designed to release its contents for up to 4 hours promotes greater bioavailability. Who is Ultra C ideal for? Anyone who leads a busy, high-stress lifestyle and feels they may not be getting enough Vitamin C from their diet. What's In Beverly International Ultra C? How Do I Take Beverly International Ultra C? Take 1 tablet of Ultra C daily. We have a large selection of in-stock Beverly International products including Vitamin C items and others for the lowest prices at SameDaySupplements.com® It's always easy to shop for Ultra C By Beverly International, 100 Tablets at SameDaySupplements.com because you can browse by reviews, brand, prices or search for specific ingredients using our search tool. In-stock orders placed before 3pm EST ship out the same day to USA, Brazil, United Kingdom, Canada, Germany, Australia, Japan, India, France and worldwide at the cheapest prices online.